CLASSMATES IV. OUR TEACHERS WILL NOT BE PRESENT. The truth is that I think you will find, in your classmates at the little school, something of the best of this world. But you will also miss, once you are in these lands of resistance, the presence of others who are and have been very important for us as Zapatistas. 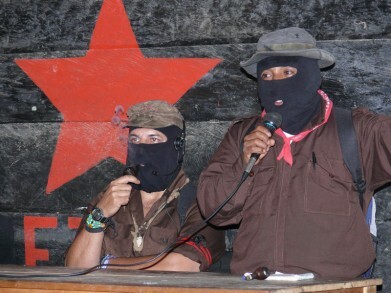 They are those who have always accompanied us, guided us, and taught us with their example, but who are not, just like many others in every corner of the world, from the EZLN. Some are part of the Sexta, some part of the National Indigenous Congress, and many more have built their own “houses” (organizations) but nevertheless walk the same path that we do. All of them are, in some way or another, participants in our advancements, as great or modest as these may be. Only we are responsible for our errors and failures, which have not been small or few, . We tell you this because perhaps you have asked yourself how or by whom we were taught to resist, to struggle, to persevere. And most importantly, perhaps you will ask yourself why, at the little school, the native peoples of Mexico and the world—particularly those of Latin America—will not be at your side as fellow students. The answer is simple: because they are and have been our teachers. Thus those who came first, whose blood and pain built the modern world, the original peoples, will not be present. Neither the indigenous peoples nor their most representative organizations will be your classmates. Perhaps you are asking yourselves if we have gone crazy, or if this is some kind of dirty trick—politician-style—to supplant the Indian peoples and present ourselves as THE indigenous people par excellence. But no, we simply didn’t invite them because we have nothing to teach them. Could we teach the Indian peoples what it means to be treated as a stranger in these lands that were ours long before the world would begin that twisted telling of history from above, and where they imposed, in our skies, foreign flags? Could we teach them what it means to be the object of ridicule for our clothing, our language, our culture? Could we teach them what it means to be exploited, dispossessed, repressed, and disdained for entire centuries? What could we teach to the brothers of the Yaqui tribe and the Mayo Yoreme about the theft of natural resources and what its necessary resistance means? What could we teach to the Kumiai, the Cucapá, the Kikapú, the Pame, about what it is to be persecuted almost to extermination and nevertheless persist? What could we teach to the Nahua, whose lands have been invaded by mining companies and corrupt government officials but who, without regard for the persecution and death that they suffer, continue their struggle to throw out those invaders who come under the flag of money? What could we teach to the Mazahua and the Ñahñu about how it feels to be ridiculed for their dress, their color, their way of speaking, and instead of being shamed, paint the wind with sound and color? What could we teach the Wixaritari about the destruction and dispossession of culture under the banner of “progress,” or about resisting under the guidance of their elders? What could we teach to the Coca, the Me´hpaa, or the Teneke about not surrendering? What could we teach to the Amuzgo about fighting for their rights? What could we teach to the Maya about the violent imposition, theft, and criminalization by a foreign culture subjugating their original one? What could we teach to the Purépecha about the value of the life in indigenous culture? What could we teach to the Popoluca, Zapoteco, Mixteco, Cuicateco, Chinanteco, and Chatino about what it means to keep fighting even though everything is against them? What could we teach to the Rarámuri about a quiet hunger and an invincible dignity? Could we teach anything to one of our older brothers, the Mapuche people, about what it means to resist the continuous war of dispossession and extermination? About how to survive a long list of lies, aggressions, and ridicule painted all of the colors of the politicians above? What could we, the Zapatistas, the smallest of them all, teach any of the originary peoples of Mexico, of the Americas, of the world? What are they going to learn from us? Their very existence demonstrates that they should give classes in the great school that is the world, not receive them. So no, we didn’t not invite the original peoples to the little school for the simple reason that, in our history, we have been the clumsy students of these giants. Are we going to teach them what it is to live in a community, to feel what it is to have another culture, another language, another way? To imagine and create resistances? In any case, we the Zapatistas still have much to learn from the Indian peoples. So they will come after, and we will go learn from them. And when the special gathering with them takes place [the Seminar Tata Juan Chávez Alonso scheduled for August 17-18], our best sounds will be played, the most vivid and diverse colors will adorn their path, and our heart will open once again to embrace them, our older brothers, the biggest and the best. Because to honor those who teach is to honor the earth. They will come to our homes, and with them we will share food and memory. We will lift them above us. Standing on our shoulders, they will rise even higher. And we will ask them what they see. We will ask them to use their eyes to teach us to look further, wider, deeper, higher. To give us their word and let us drink from it. To help us grow and be better. We have always and will always offer them our greatest embrace. So, our teachers will not be at the little school. But don’t be sad. We are sure that these peoples, who have resisted until now every possible kind of attack, will know how to be generous and, when the time comes, will open their hearts to you, as we do now. Because they taught us not to look at the noise that deafens and blinds. Because they taught us not to listen to the colors of trickery and money. Because they taught us to look at them and look at ourselves, to listen to them and listen to ourselves. Because they taught us that to be indigenous was to have dignity as a home and a destiny. Because they taught us not to fall but to rise up. Because they who taught us the value of being the color of the earth. Because they taught us not to be scared. Because they taught us that to live, we must die. Vale. Cheers, and silence so as to listen to the step that comes from deepest point of the world that the world is and has been. Watch and listen to the videos that accompany this text. Sub-verso, with Portavoz, with the track, “Lo que no voy a decir” (what I’m not going to say), with honor and greetings. Long live the Mapuche People. In memory of Juan Vázquez Guzmán, tzeltal indigenous member of the CNI and adherent of the Sexta, murdered in April of 2013 in Chiapas, Mexico. Here remembered by his compañeras and compañeros of the Ejido San Sebastián Bachajón, and by all of us. Aho Colectivo, with Venado Azúl, Rubén Albarrán (Café Tacvba), Poncho Figueroa (Santa Sabina), Roco Pachukote (Sonidero Meztizo), Lengualerta, Hector Guerra (Pachamama Crew), Moyenei Valdés (Sonidero Meztizo), Valle González-Camarena, Memo Méndez Guiu and Moi Gallo in the musical part, Marcoatl, el Gallo, Benjamin Ramauge, Gaby Fuchs, Damian Mendoza and Jose Matiella, making it clear that WIRIKUTA DOES NOT SELL OUT, WIRIKUTA DEFENDS ITSELF!